Born in Omaha, Skip Stephenson attended the University of Omaha for one year before becoming a DJ at KCOW-AM in Alliance, Nebraska. For thirty years, he was an active stand-up comic. In 1979, with Sarah Purcell and John Barbour, he was hired as co-host of Real People, a pioneering reality TV show featuring ordinary individuals with amusing hobbies or occupations. He made occasional appearances on game shows, including Match Game and Hollywood Squares. 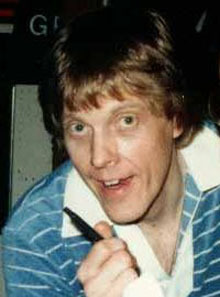 Stephenson released a comedy album in 1980 and a video in 1991. A smoker, he died at the young age of 51 from a heart attack at his home in Los Angeles. Words on his tombstone: "Procrastination ends here."